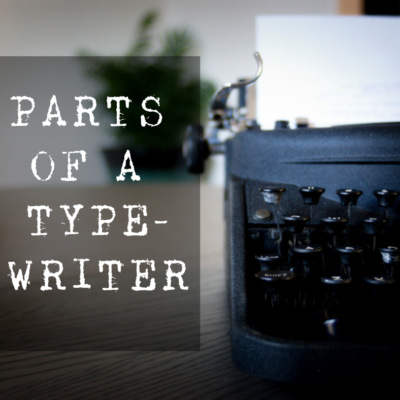 This is the second post in my Typewriters 101 series. 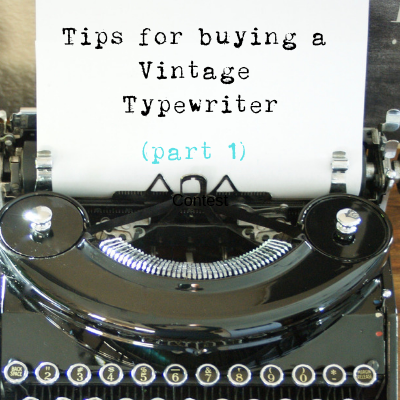 I’m putting these out as fast as I can as I get many questions on how to operate and maintain vintage typewriters. You’re going to make mistakes. I guarantee it. And at first, you might flip out and think you have to start with a fresh piece of paper every time you make a mistake. The problem is unless you type VERY slowly and deliberately, that will never happen. You won’t be able to type a mistake-free page. Part of the charm of typewriters is being able to let yourself make mistakes and be okay with it. 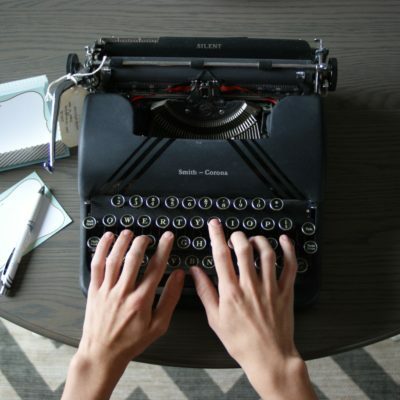 For the majority of writers, anything created on a typewriter is considered a rough draft or first draft. When you do make a mistake, simply backspace and type an uppercase X over the letters or strikethrough the letters. Then keep typing. 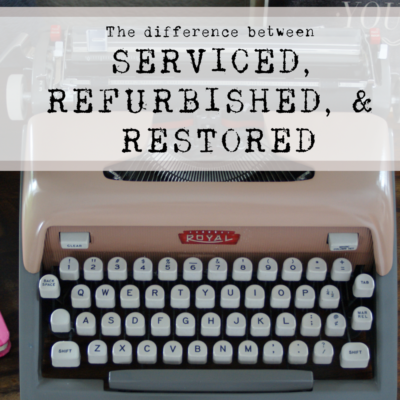 That’s why I say in my Tips For Buying A Vintage Typewriter post that you want to make sure the backspace key works…because it will become your best friend! 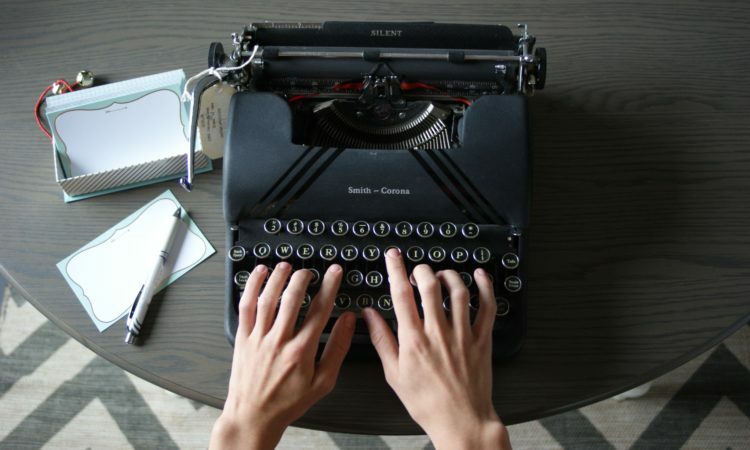 With the risk of sounding like Captain Obvious, typewriters are not digital and require a way to imprint ink to paper. When you press a key on your typewriter, it moves a KEY BAR to hit a ribbon soaked with ink, making an impression on the paper. Duh, I know, but this IS about the basics. 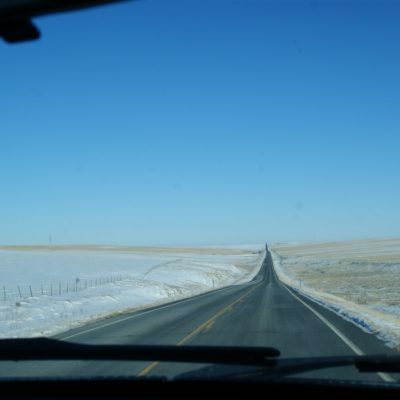 What you may not know is how long the ribbon lasts or what to do when it does get to the end. Most typewriters use a universal ink ribbon while some of the Smith Corona typewriters from the 70s and 80s use a cartridge. Ink can dry out on ribbons. It does take a while, but it happens. If you are not going to use your typewriter for some time, I recommend putting your ribbons in a sealed plastic bag. Ribbons are reversible! 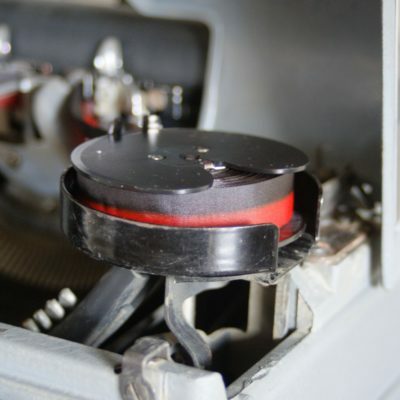 Many folks don’t know this: when you reach the end of your spool, your typewriter has a lever (it’s different on each typewriter) that reverses the direction of the ribbon. This allows you to use the same ribbon multiple times before needing to re-ink it or purchase a new one. 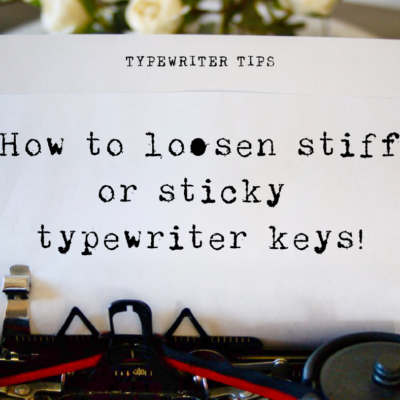 If your letters start to look lighter as you are typing that means you need to check one of two things: you’ve either reached the end of the spool and need to reverse the ribbon, or the ribbon needs to be re-inked or replaced. Ribbons can be re-inked (we’ll talk about this on a future post). Cartridges must be replaced. (You can purchase both cartridges and universal ribbons here). All typewriters will take basic 8.5 x 11 paper. The nice thing about typewriters is that you can use different thicknesses of paper and various sizes. It all depends on your machine. I like to cut out unique sizes of card stock and type quotes on them. It makes great alternatives to a business card! There’s a lot more flexibility with paper when you’re using a typewriter than there is with most printers. You’ll want to load the paper at the back of the typewriter, against the paper rest. Then, use the roller knob to turn the platen and roll the paper underneath. If the paper is not even, then look for your paper release lever. This releases the tension and makes it easy to adjust the paper so that it is even. (We’re working on some videos to show you what we’re talking about). Each typewriter has a very particular way in how it feels and types. Electric typewriters are the easiest to type on and are great for very fast typists. Manual typewriters will take some getting used to. The older the typewriter, the more you will have to practice to figure out what is the best way to type on it. We are used to very light touch on our computers and not having to press down with much effort. Yet, as you are typing on a manual typewriter, you’ll find that at first, it feels like you are pressing the key to the floor! You may even need to build up your muscles in your fingers (I know, weird). 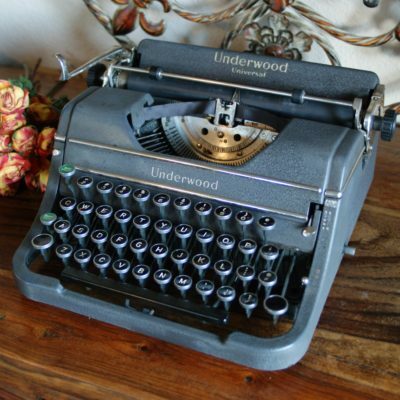 When I brought my typewriter home this summer, I literally had to use my index fingers to type because my fingers weren’t long enough or strong enough to press the keys down! As a result, I was hitting the keys so hard on some of the typewriters that it wasn’t typing correctly. 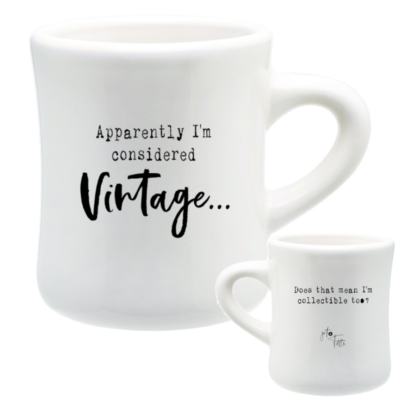 It took my husband to show me that I had to relearn the proper touch. Instead, you need to HIT the keys with a light, quick stroke, keeping your hands from resting ON the keys. …then you are probably too heavy-handed with the typewriter. 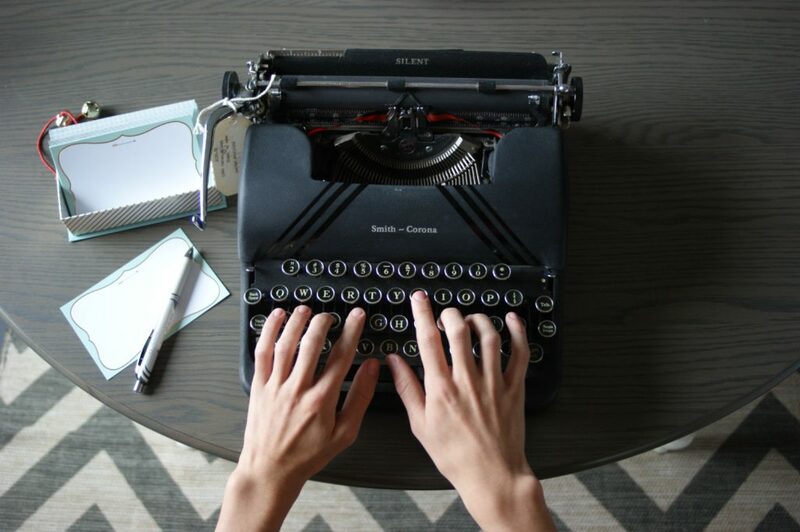 Keep watching our blog as we put out a new post every week on how to use your typewriter. This post is SUPER basic, and even then, doesn’t even cover all the basics. Please be patient as I get out blog posts as fast as I can so that you have a good resource for all your typing questions. We’ll also be uploading manuals for you to look at. While they may not be specific to your typewriter, as we find user manuals we are scanning them because we know it is a helpful resource no matter what you are using. In the meantime, please feel free to contact us with any questions you have or send us a message on Facebook.